This article originally appeared in the Fall 2017 edition of the Hardhat. Two September orientations at the Aluma branch office in Fort McMurray attracted 60 new and transferring members living in the Municipality of Wood Buffalo, as well as a few special guests. Alberta NDP government Ministers Christina Gray (Labour) and Marlin Schmidt (Advanced Education, including apprenticeship) were on hand to speak about the role that government and politics play in shaping the world of union vs. non-union labour. The Ministers also toured the shop and yard and were treated to a rope-access demonstration in the company’s mock-up facility by Aluma’s Jon MacLeod. As more contractors and owners cut costs down by focusing on more local hires, we are responding. But, new members living in Fort McMurray or Grande Prairie or Hinton and Peace River are still expected to learn the principles of our union, and how to be good union members. The process of new member orientations has always been a crucial part of the work that we do as a union. The principles of the COMET (Construction Organizing Membership Education Training) course that the orientation was developed from have not changed, but the delivery of the program has. An interactive style of course delivery intersecting with video, guest speakers, and traditional writing exercises is designed to help new members better retain the quantity of information they have to learn as new union members. New members are instructed on the basics of organizing, and on the idea that working non-union is okay, even helpful at times (as long as it is reported), but working for a labour organization that is in direct competition to the United Brotherhood of Carpenters is not. More important for those looking to bid work with our signatory contractors is the standard of excellence and code of conduct sections of the orientation. New members are drilled with our drug and alcohol policies, a message on zero tolerance for excessive lateness or absenteeism, and the message to only take proper lunch and coffee breaks. Finally, a strong message on anti-harassment and anti-discrimination is delivered. Members may have noticed smaller numbers of new members taking the oath at the monthly meetings. There has been a sharp curtailing of intakes, particularly among unemployed or inexperienced potential members. However, we continue to accept new members from organizing drives, red seal and indentured apprentice carpenters, sons and daughters of members who show promise through the ITT program, and of course referrals from the Helmets to Hardhats program to assist veterans from the Canadian armed forces. 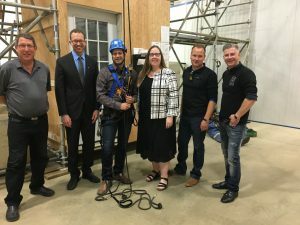 Alberta NDP Ministers get a Rope Access demo (left to right): Jeff Pardee (Aluma), Minister Marlin Schmidt, Jon MacLeod (Aluma), Minister Christina Gray, Mike Mayuk (Aluma), Jeff Sloychuk (Recruitment & Communications Representative).